‘Ken Champion’s reputation was forged on the basis of his talent for exquisite miniaturism and his ability to anatomise the subtleties of close relationships in and around his beloved London. In his expansive new novel, Champion confidently strides the global stage cleverly inter-linking three lives as he reflects on relationships, work, community and what success means for people and places in the fragile, crash-and-burn economy of the 20th Century. ‘The reader never doubts that the separate threads of this novel will be gathered up in the end, and they are - along with satisfying surprises, revelations and a climactic dialogue about the meaning of ‘progress’ in a city’s construction. 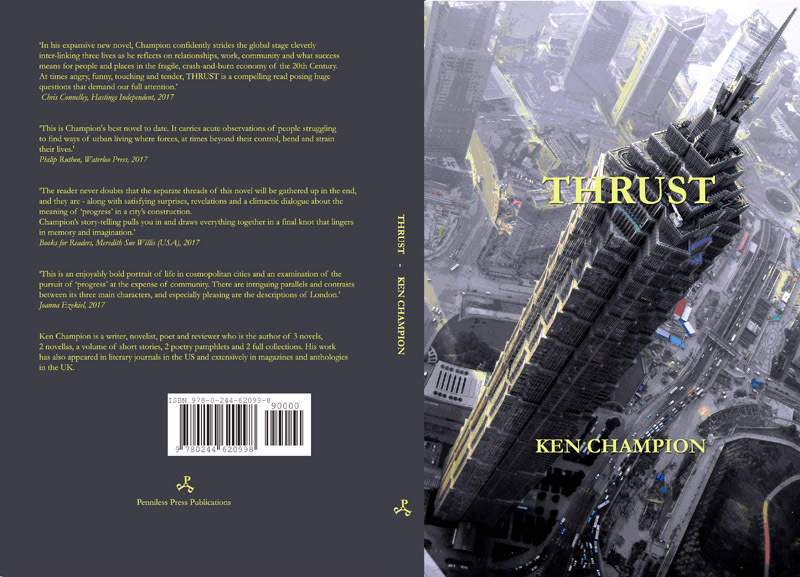 Ken Champion is a writer, novelist, poet and reviewer who is the author of 3 novels, 2 novellas, a volume of short stories, 2 poetry pamphlets and 2 full collections. His work has also appeared in literary journals in the US and extensively in magazines and anthologies in the UK.